Meet our Newest Family & Help Us Name the Kittens! Izzy was thrown away by her family and left to fend for herself. Pregnant, with no safe place to give birth, Izzy frantically clawed at a wooden grate until she cleared it away to access the underside of a family's home. At least it was away from the tidal marsh that was prone to flooding and filled with predators. Maybe her kittens wouldn't drown right away, but how long would they all survive? 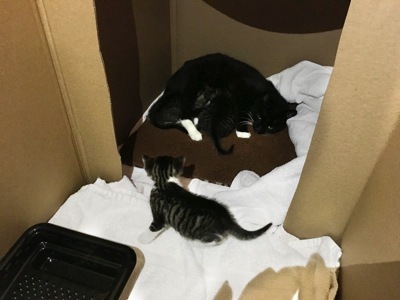 Thanks to the kindness of the family who found her and our friends at Animals in Distress for trapping Izzy and gathering up her kittens, when we were called in to help we jumped at the chance. Now Izzy and her 4, 4-week old kittens need you to make their rescue dreams fully realized. We're hoping to raise funds to cover Vet care and food costs for both Izzy and her growing family. 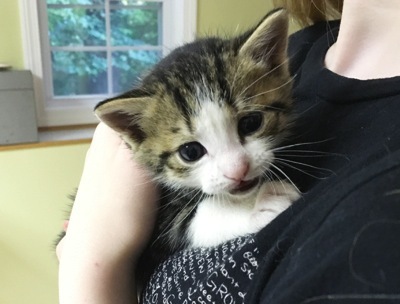 Since the kittens don't have names yet, we thought it would be fun for every $10 donation towards their care, YOU CAN GIVE US YOUR NAME SUGGESTIONS! We'll choose our favorites from the list and maybe one of them will be yours? Rescue takes a community where we all do our part. I hope you'll be able to share your love for this little family, who would have perished if someone didn't step up and say YES, I'll help. I hope you'll step up and say YES, I'll help, too, by making a DONATION TODAY or by choosing any items you like from our Amazon WishList. That way you can share a special gift for our kittens to enjoy. Thank you for sharing our passion and love for cats and kittens!